The 4-Port Industrial Grade Hub is a high quality USB hub designed to instantly add 4 USB 2.0 ports to your PC or Mac desktop or notebook computer. This 4-port USB 2.0 hub supports high-speed (480Mb/s), full-speed (12Mb/s), and low-speed (1.5Mb/s) data transfer rates, and allows you to hot-swap devices (connect and disconnect) without first turning your system off. The 4-Port Industrial Grade USB Hub features over-current protection to protect your connected USB devices and the hub itself from unforeseen power surges with automatic link and speed detection to deliver optimum USB performance and reliable USB data transfer. This 4-port industrial grade USB hub is an excellent choice to accommodate your USB devices. 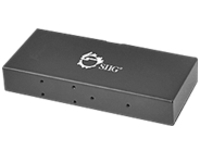 The 4-Port Industrial Grade USB Hub is FCC and CE regulatory approved and RoHS-compliant. In addition, it is compatible with a wide variety of Windows and Mac operating systems.